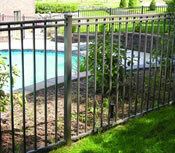 This smart-looking 3-Rail style is BOCA-code approved for pool enclosures. Available in Residential Series and Residential Series Premium (not offered in Commercial grade). 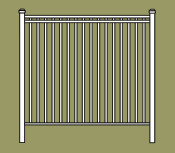 The Residential Premium style has a reinforced double-wall rail for safety. Standard sections are 6' wide x 4', high. Sections come fully assembled. Custom width or height sections are available.